Vietnam is the perfect travel dish. The spicy nightlife spills into the morning, the sweet scenes of green peaks and rice paddies burst out of nowhere, and a thick and savoury stew of temples and traditions coat everything you see. 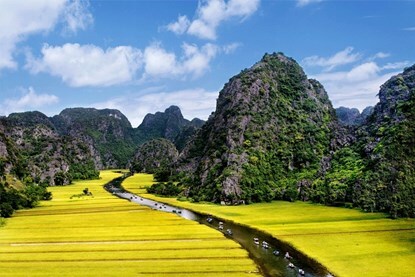 On this adventure, you fill your belly with the most nutritious experiences of Vietnam, stay in a homestay as close to the local culture as possible, and discover the caves, valleys, and vistas that adorn all the Vietnam travel guides. Visit Vietnam, become a culture glutton, and discover one of the most bountiful countries of Southeast Asia! We spend 14 days exploring Vietnam. We visit Hanoi, Ho Chi Minh City, Hạ Long, Hue, Da Lat ,Hoi An, Nha Trang ..
Discovering the incredible charm of Hoi An's historic streets and islands surrounding. Relaxing in a hammock or exploring some waterfalls in the mountain or snorkeling off the waters of Jungle beach - the quietest & the most relaxed beach in Vietnam. This is a great chance to wander the streets and find all the interesting little shops on the street and down the alleys. But don’t forget and map, even Ferdinand Magellan would have gotten lost in modern day Hanoi! Enjoy a halfday Hanoi city with the tour guide and get a glimpse of a local perspective in mythology, traditions and customs of Vietnam. 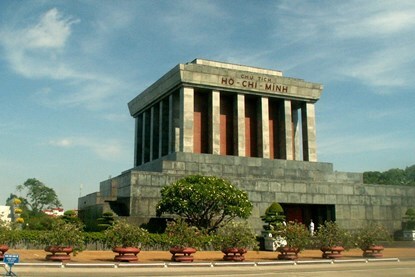 We will visit the Ho Chi Minh complex to discover the heart of Vietnam at the "Uncle Ho" mausoleum. See the house on stilts, and picturesque single pillar pagoda, built by wood in the 11th century. 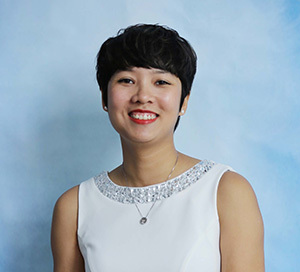 You will then visit the Temple of Literature, the site of what would later become the first university of Vietnam dating back around 1070 and originally built as a temple of Confucius. Afternoon, we begin continue the tour by cycling along the Red River dyke, crossing the Long Bien Bridge and continue riding along the dyke for some kilometers before joining a small biking trail that furrows among corn, vegetable, and fruit gardens. After about two hour cycling, you arrive in Bat Trang village. The village is famous for ceramic and pottery products of high quality. You will then have a short walk through the village, discovering the village ceramic market, the Bat Trang temple, Bat Trang communal house and you learn all the steps of making the pottery. You enjoy two more hour cycling back to Hanoi. With some many little restaurants, cafes, and bars tucked into every single corner and alleyway of Hanoi, you’ll be sure to find a few great ones. No matter how many times to you out in this charming city, you’ll never run out of new spots to go. On this 2 Day and 1 night Oasis Bay Party Cruise tour you will spend a day exploring and enjoying the magnificent Halong Bay and one night on our Oasis Bay Party Cruiser 5-star boat with activities including water trampoline, kayaking, swimming,jumping from the boat, floatables and relax in one of our 3 Jacuzzis. As the sun starts the set on our picturesque landscapes we bring everyone for and invigorating, and hilarious Oasis Bay infamous Beer Yoga class. The Yogis have never had so much fun, and the drinkers have never felt so limber, this 30 minute session is for anyone and everyone. Now, that we are loosened up and the sun has set, its time for happy hour. After dinner the staff put on a great performance and might even get you involved. We ship a DJ in from Hanoi every night, to play some great beats for you. Once everyone has got some breakfast, your tour guide will do a little cooking demonstration for you, with a little bit of interesting facts and culinary history. You will have a chance to get your hands in there too and have a try yourself. You will have one last lunch on the boat before we disembark and return back to Hanoi. Arrival in Hue and take a short break before starting Bach Ma National Park day trip. On the way Tour Bach Ma, you stop at Cau Hai lagoon to take some stunning pictures of the lagoon and learn more about the life of a local fishing village. Continue the trip to the Visitor Center, which is near the gate of the Bach Ma national Park. Here, you will be introduced some information about Bach Ma National Park and its biodiversity potential, learn more about its significance, and conservation of the fauna and flora. Then you will continue the tour by exploring Bach Ma summit, which is 1.450m above the sea level. 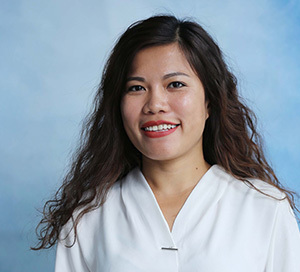 Here, you visit Hai Vong Dai. After visiting Hai Vong Dai, the car will continue to explore Five Lakes. You will stop at Lake No. 5 to take a rest, have a light lunch and then soak in cool water of the lake. After that, you continue trekking to Do Quyen waterfall, a beautiful and majestic waterfall of the national park. Return to Hue and drop you off at your hotel in Hue city. Take your time in the morning and enjoy a relaxing breakfast, the bus leaves for Hoi An at 10am. Arrival in Hoi An at around 13:00 and you will be transferred to your hotel in Hoi An. You are free to explore ancient town by your own, or enjoy swimming and tanning at An Bang beach. We hope you brought your appetite, because Hoi An is home to the best food in Vietnam, with many local specialties to indulge in. Overnight in Hoi An at the hotel. Morning you will be transferred to the pier. Board the wooden boat, and float along Thu Bon. 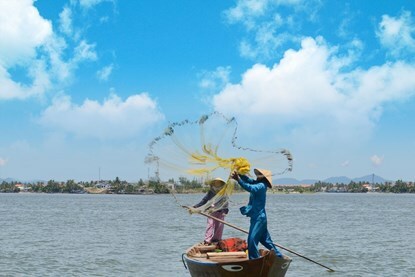 From there, you can admire the busy life along the riverside of the charming Hoi An, Ancient town. 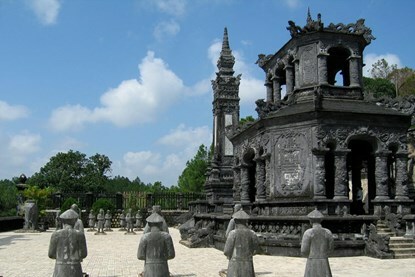 The boat will stop in Thanh Ha Pottery village where you can enjoy rural countryside with the clever pottery artisans. The boat continues stopping at Kim Bong Village – the motherland of the most talented woodwork carpenters in central Vietnam, and at the harbor, to start walking to the old town. Follow the narrow lanes lined with homes centuries-old, influenced by Chinese, Japanese, French and European architectures, and visit numerous places of interest:the 400-year old Japanese Covered Bridge, Phuc Kien Assembly Halls, the local fish market. After your walking tour, if you have free time, you can do some shopping in the ‘old town’. Your tour guide will take you back to your hotel. You will take night bus from Hoi An to Nha Trang. Overnight on sleeping bus. Arrival in Nha Trang in the early morning then we will transfer you to Jungle Beach hotel. You can take free bicycles, or there are motorcycles for rent that you can take along the 12km coastline road that runs behind Jungle Beach. It offers spectacular views and a picturesque little fishing village at the end of it, where you can buy great coffee and cold beer! There are also the famous Salt Fields 25 kms away on small country roads. Alternatively, you can Relax in a hammock or explore some waterfalls in the mountain or snorkeling. You have another do explore the area or relax on the beautiful beaches. Overnight at Jungle beach. Enjoy your morning and take your time checking out of the resort by noon. After lunch you will board the bus to Dalat (Bus departs at 13:00 P.M – arrives at 17:00 P.M). Arrival in Dalat, you will transfer to hotel in Dalat. Depart at your hotel in Dalat, we take you along picturesque road to the south of the city, head the Datanla waterfall. Stop at gathering point,You will learn the basics of knot tying, harness wearing and abseiling techniques to begin conquering the 10km adventure activities hidden deep in the jungle. This is the first activity after we mastered the skills to rappel down the steep cliffs. 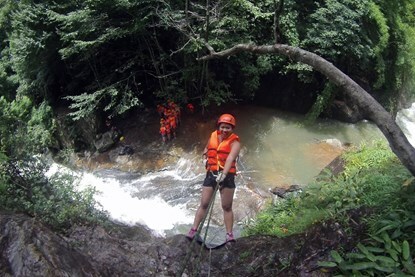 Test your skills and lower yourself down the sheer cliff using only ropes and harness. Over time, the stones have been eroded by the water, creating a beautifully smooth path for us to water slide down into the thrashing water below. Lay back arms crossed, lifejacket and helmut still in place, we’ll let you go and you go slip-slidding down into the pool below. A slick rock wall is all you have push off against as you lower yourself all the way down into the water this time. Heres your chance to take jumps from 7m and 11m cliffs into a deep lake. Do not hesitate, be strong, nothing can stop you, but the water below. You will rappel down, rock walls on both sides, then all of a sudden there are no more walls and you asitting in your harness, dangling in mid air. Regroup and start to slowly lowe yourself down again. The water is flying through the air, flung from a cliff next you you. Lower yourself down into the chute of water as it starts blasting your body back and forth, all of a sudden you know why they named this one the “washing machine”, it turns out ‘you’ are the dirty laundry. Time for a brave plunge, as you make the final effort to let go of all the ropes, releasing your harness from the safety of the ropes, the water grabs hold of you and pulls you down into the falls, as you pop up on the other side, that was an extreme adventure you weren’t quite expecting! 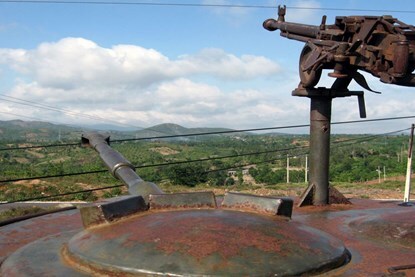 You have a day to explore the beautiful city of Dalat. A few things you may want to visit is the Crazy House or 100 Roofs, take a paddle boat around the lake, visit the flower gardens that Dalat is famous for, or even play a round of golf on one of Dalat’s many world class courses. In the evening, we will transfer to bus station for night bus to Ho Chi Minh city. Arrive Ho Chi Minh city in the early morning then we will start the Mekong delta exploration full day tour. 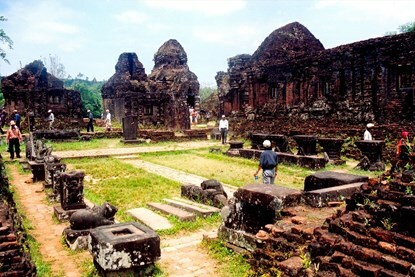 This tour will be an ideal option for those who wish to experience the real Mekong Delta rich in culture. The day tour leads you to Mekong Rustic in Cai Be town where you will embark on the boat to visit the Cai Be floating market for some tropical fruits as well as to meet and talk to the local sellers, right on the boats. Also, you will have a chance to stop at the abundant orchards, observe them doing the gardening and enjoy the fresh fruits. The tour will be incomplete without a visit to the local's traditional handicraft villages, the religious building of Cao Dai Temple, Cai Be Cathedral and the ancient house in Cai Be. You are free at leisure until we transfer to airport for your flight.